The Brainstorm long read: how did part-time work, zero-hours contracts and independent contracting become the norm? The emergence and continuing rise of the gig economy has been phenomenal. One of the most widely debated trends in the world of work, this system features online platforms that match the supply and demand of work in a range of areas, on a short-term and payment-by-task basis. Although offering varied services, organisations in the gig economy share a new, seemingly alternative means of conducting business exclusively via digital platforms (usually smartphone apps) to share and capitalise on skills and resources in local markets. Recent years have seen several businesses grow under this umbrella across diverse sectors and offering a wide variety of services. Organisations that one might readily associate with the gig economy include Uber (transportation), Deliveroo (food delivery), and Airbnb (accommodation). Irish start-ups have also been involved, with companies like Buymie and Fleet offering on-demand grocery delivery and car rental services respectively. Discussion on the gig economy has been hugely diverse. Some praise its innovative use of technology to facilitate on-demand needs, while others question the sustainability and fairness of working conditions. While the gig economy’s digital on-demand principle makes it hugely successful, the same core feature renders workers more disposable, prompting intense criticism and debate. So where did the gig economy come from? Why is it so controversial? And what does it mean for the future of work? During the global economic crisis a decade ago, the nature of work transformed dramatically. Jobs, especially in the traditional sense, became harder to find. Ireland’s unemployment rate during the recession peaked at 15 percent in 2012, with the young population perhaps most heavily impacted. Youth unemployment figures climbed to 33 percent, while the overall figure of young people not in employment, education or training reached 22 percent, double its pre-recession figure. Because of this, many were left with little choice but to work when and wherever they could, partaking in short-term, precarious roles as a means of making ends meet. The most obvious outcome of this has been the growth of contingent work, which includes virtually any arrangement that differs from the norm of a full-time wage: part-time work, temporary work, agency work, zero-hours contracts, independent contracting and so on. A decade on with economic recovery on-going, traditional employment still continues to erode. Different patterns of work, greater variety of forms of employment contracts, and an increasing desire for flexibility have transformed contemporary working relationships. Recent research by the ESRI which was commissioned by the Workplace Relations Commission shows around 200,000 Irish workers in temporary or other non-permanent employment arrangements. Why is this happening? Put simply, the traditional notion of full employment is at odds with organisations’ needs for competitiveness. The need for flexibility by employers seems irreconcilable with the needs of those excluded from the official workforce. This broadened perspective on what constitutes work, populated with various types of untraditional arrangements, has led to contingent work emerging as the new normal type of contemporary employment. As the world of work continues to transition, the gig economy has emerged as a key driver of this change. Work in the gig economy has roots in many of the contingent arrangements listed above. Gigs are typically neither full-time nor open-ended, with a lack of long-term commitment from both workers and organisations. Likewise, gig working hours are unpredictable, with arrangements usually being highly-flexible and dependent on the level of demand at any given time. Put simply, organisations operating in the gig economy operate digital platforms that connect customers directly with service-providing workers who are classified as self-employed independent contractors, rather than employees. Workers complete hyper-flexible tasks or gigs for a defined time, with minimal commitment between parties. Gig workers are normally paid for each individual task completed, with organisations keeping a fixed-rate percentage from each transaction. Growth figures in the gig economy are fascinating. In Ireland, Airbnb has over 23,000 active listings available on its platform. Likewise, food-delivery service Deliveroo has over 900 riders in Irish cities and regularly receives over 400 new ‘rider’ applications weekly. While plans to expand Uber’s ride-hailing service across Irish cities remain unsupported by the National Transport Authority, the company recently announced plans to grow its Centre of Excellence in Limerick as it continues to focus on markets in Europe, Asia and the Middle East. A closer examination of worker numbers across organisations depicts a striking image of the scope of the gig economy. Uber has almost three million drivers in 600 cities worldwide, but it only actually employs 16,000 people globally, with all others being classified as independent contractors or "partners". Similarly, Deliveroo boasts over 30,000 riders in 350 cities, but only acts as employer to around 1,000 people in total. Similar figures are common across the majority of gig organisations, showing the stark contrast between those working in the gig economy and those officially employed in the sector. With the diversity of services available in the gig economy, work can take several forms. Some gigs are based on the remote completion of online tasks ("crowdwork"), while others rely on the sale or lease of goods or assets (e.g. Airbnb). However, most key debates surrounding gig work focus on well-known, popular platforms that offer more traditional services in local markets, such as food delivery or transportation with Uber, Deliveroo etc. The platforms and apps providing these services typically intervene in managing and setting minimum quality standards, working conditions, and payments. Due to this, it is argued that there is considerable scope for these gig workers to be considered as employees rather than self-employed independent contractors. However, the legal ramifications of the term "employee" has seen most gig organisations distance themselves by adopting other monikers to classify these workers, such as "riders" or "partners". Consequently, most gig workers lack employee status and all associated protections and benefits, such as holiday pay, sick leave, insurance, and so on. While this undoubtedly lowers labour costs for gig organisations, tight levels of control and questionable working conditions reported by workers raises issues surrounding the erosion of employment standards and labour regulation. Uber is regularly cited in these cases and has battled a multitude of highly-publicised legal issues surrounding regulation and workers’ rights. Deliveroo is facing similar challenges, with workers fighting for employment status, minimum wage entitlements, along with other protections. While the outcomes of such cases have varied across regions, no wide-scale legislative or policy movement has emerged to date. Consequently, it seems that pressure is now mounting on legislative bodies and policy-makers to revise the appropriateness of the current ‘worker’ and ‘employee’ classifications. .
Has the gig economy transformed work? Workers must electronically accept detailed Terms and Conditions before accessing gigs, allowing organisations to retain control over most aspects of the work completed. By monitoring workers, platforms decide how often and in what context participants are exposed to each other, what information is collected, and how this information is displayed. 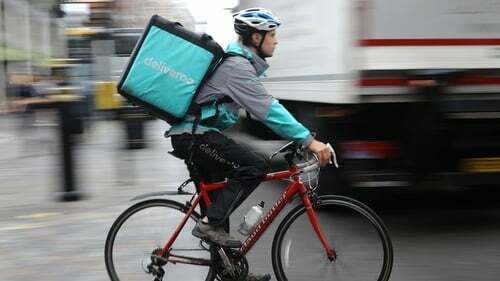 Additionally, GPS technology tracking allows organisations like Deliveroo to send performance reports to workers showing how their average delivery metrics compare to an algorithm’s calculation of how quickly they should have been able to complete orders. In the gig economy, it seems as though the traditional "tyranny of the clock" has been replaced by the "tyranny of the algorithm". Customer ratings received via apps are crucially important for workers, with low ratings potentially resulting in workers being deactivated from platforms without much warning or opportunity for workers to explain or defend themselves. For Uber drivers, an average rating of 4.6 or lower out of a possible 5 can result in deactivation in most cities. These ratings are issued anonymously by customers via the platform, perhaps without awareness of the consequences that a four-star rating may have for workers. Recent studies on gig platforms show that the difficulties facing workers may be creating retention issues for organisations, with 52 percent of gig workers exiting with 12 months and 40 percent within the first six months. In the gig economy, it seems as though the traditional "tyranny of the clock" has been replaced by the "tyranny of the algorithm". Worker inductions, assignment of tasks, performance feedback, payments, exit management and so on are all controlled and delivered via digital platforms. With these fundamental aspects of more traditional employment all recognisable within the gig economy, albeit via digital means, issues surrounding the status of gig workers become more apparent. If this is the case, is the supposed flexibility and autonomy advertised to gig workers simply an illusion? Financially, it is clear that the difference between "employee" and "independent contractor" is more than just an issue of terminology for gig workers. A sizeable list of protections and economic benefits are at stake depending on how the relationship is classified. While many gig organisations boast attractive potential earnings well in excess of the legal minimum wage (Deliveroo offers Irish riders the opportunity to earn up to €120 daily), the reality is often different. If platform demand is low, workers may spend significant time waiting for gigs to appear. These waiting periods, along with all expenses incurred, are not compensated by organisations. While gig workers can theoretically work whenever they want, they are incentivised or left with little choice but to work at peak times when demand is higher. For example, Deliveroo currently pays Irish riders between €4.25 to €4.75 per delivery rather than an hourly rate. While potential earnings per hour may be exceed the statutory minimum wage of €9.55 on this package, it also makes workers vulnerable to earning little or nothing when orders are scarce or when the platform is congested with delivery riders. Similarly, Uber incentivises its drivers to work at peak times by using a surge pricing system, which algorithmically controls prices, without warning, based on supply and demand. From a non-financial perspective, gig work may be considered rewarding for participants in terms of establishing social connections and offering stepping-stones to more stable employment. For example, Deliveroo riders are known to form WhatsApp messaging groups as a means of forming social networks with fellow workers, in addition to meeting at designed locations across cities during quiet periods. Likewise, research indicates that many gig economy participants seek to develop their professional identity through roles, in hopes of cultivating skills and opportunities useful in furthering their careers. However, with generally unpredictable and insecure payment plans, the reality is that many gig workers are left susceptible to low income, despite making themselves available for work. Payment on a task-by-task basis means that when demand for goods or services is low, the risk is no longer absorbed by the organisation, but by the individual worker. What's the future for the gig economy? Currently, an estimated 162 million people in Europe and the United States, or 20 to 30 percent of the working-age population, engage in some form of independent work and this figure is only expected to rise. Millennials will become the largest generation in the workforce by 2020, and research shows that 72 percent of millennials want to be their own boss. Consequently, it is projected that over half of the US workforce will be engaged in some form of independent work over the next five years, with European trends following closely. The gig economy seems to provide an attractive gateway for workers, giving them control over how to spend each hour and minute of the day. But, it seems that experiences of gig workers are very much dependent on individual circumstances and the level of control exerted by the platforms they work for. For some, the flexibility of gig work is very much appreciated, with many seeing this as a fair trade-off for any lack of security and employment rights. However, controversies and criticisms have led to a renewed focus on the question of social protection for gig workers. Those dependent on income generated from gigs are more vulnerable to fluctuations in the availability of work, with recent research highlighting issues with job security, low income and worker status as key problems identified by gig workers. This poses serious and timely challenges for policy makers, employers, and labour representatives. What is clear is that the gig economy is already a significant part of economic life, both within the EU and worldwide, and it is likely to grow steadily for the foreseeable future. Figures estimate well in excess of one million gig workers in the United Kingdom, with an anticipated eight million gig workers in the United States by 2020 on the back of annual growth rates of 300 to 400 percent since 2013. Although the growth of contingent work in Ireland is expected to remain much more manageable, it would be wrong to ignore these growth trends elsewhere. Regulatory and legislative issues concerning gig workers are likely to become more pressing as this growth continues, thus creating the need to seek solutions sooner rather than later. James Duggan is a PhD candidate in Management at the Cork University Business School at UCC. Dr Ultan Sherman lectures in Organisational Behaviour and Human Resource Management at the Cork University Business School at UCC, Ronan Carbery lectures in Human Resource Management and Human Resource Development in the School of Management and Marketing at the Cork University Business School at UCC. Professor Anthony McDonnell is Professor of HRM and Head of the Department of Management & Marketing at the Cork University Business School at UCC and is a former Irish Research Council awardee.